As I promised last post, today I’m going to be telling you all about the details of my project. I am working with the Ram Rahim Pragati Producer Company, RRPPCL, which is a commodity aggregation business that works with small and marginal farmers. The central idea of the enterprise is to buy mostly corn and soybean in the rainy season and wheat and chunna (a type of lentil) in the winter season from hundreds of small landholders, store the aggregation in a warehouse facility, and wait to sell the produce to larger markets when the prices of these commodities rise. This theoretically allows the small farmers, who “form” the Company, to make a greater profit than they would have if they had sold their produce to the local village trader. Many farmers in traditional exchanges sell their produce to trader-moneylenders, who often cheat these farmers on payment or weight, taking advantage of the fact that many of the farmers are either indebted to them due to previously purchased agricultural inputs or cannot read the trader’s ledger. In the locations SPS works with, before the Company’s formation, the commodity aggregation program used to be spearheaded by the Udainagar and Kantaphod Federations, which are independent organizations made up of hundreds of Self-Help-Groups (SHGs). In order to get proper licensing to buy and transport commodities in bulk to markets outside the district and produce dividends that can be returned to the shareholders, SPS decided to launch the Producer Company, which is a for profit enterprise. The shareholders of the Company are the SHGs, who have either contributed 5,000 or 10,000 Rs. as shares. Remember that the SHGs are the savings and loan groups made up of around 20 women in a village. The primary producers of the SHGs who contributed their crop to the Company are entitled to receive dividends, or “a bonus,” if the company makes a profit after covering expenses. Those shareholders who are also farmers with owned or rented land have an interest to contribute, because only those shareholders who contribute will get the bonus. That was a long introduction, but truthfully the Company is much more complicated than that. I spent more than a week simply understanding the business side of the Company, from perusing financial statements, to browsing the Producer Company Act, to chatting with the office workers and 5 Company directors in spread out villages. This background research helped me and SPS formulate a research topic I could explore for the next 5 ½ weeks, which was more related to the groundwork than the behind the scenes financing. So because the Company is young, only about 1 ½ years old, it is grappling with how to increase the bulk of commodities it receives, because the more produce they have the higher profits they make, the larger buying markets they can tap, and the more economical transportation and warehouse costs become. That’s where my project comes in. Surprisingly, almost 1300 out of the 1800 shareholder farmers do not sell their produce to the Company. My central question asks why not, and what are the ways SPS can build repertoires with the marginal farmers to cater to their concerns and seek their support in the Company’s endeavor. I designed a survey in Hindi that asks a lot of detailed questions about type of land and the crops they sell, how much and to whom. It asks about the different tools they use to farm and from whom do they buy their inputs from, ie fertilizer and pesticides. In the more free response part of my interview, I ask the women who do contribute what are the advantages and disadvantages, do they get a better price than with the village trader, do they get paid on time, and how much do they get paid. For those who don’t, I ask them why not, listen to their many concerns, learn who they give their produce to, and find out what can SPS do to better their relationship with the farmer. I’ve been meeting with between 10 and 15 women of the SHGs at the same time, which has been wonderful because they’ve all been sharing stories together, agreeing, disagreeing, laughing, demanding, asking. It’s been very stimulating to learn about the Company from the perspective of these village women, who have such insightful opinions that never cease to make me stop and reflect deeply. 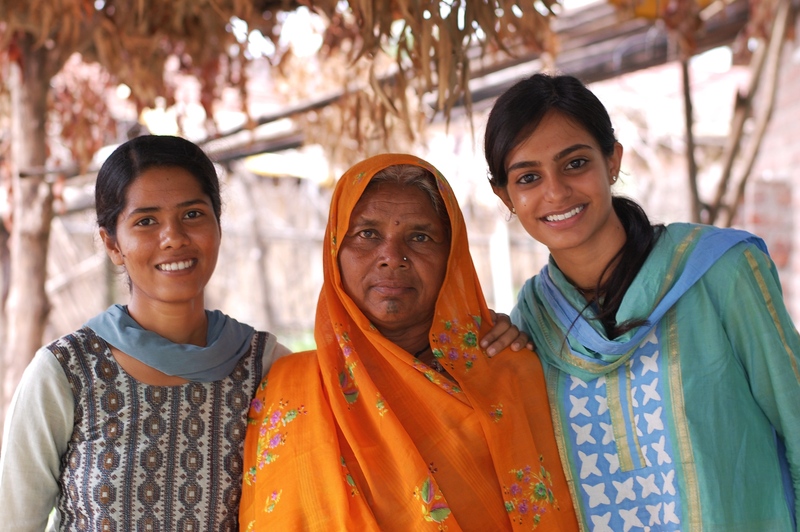 Jyotsna, an SPS worker, and a woman leader we just interviewed posing after a chat. Andrew, the SPS gang, and I went to Indore for a Sunday– the main source of excitement around here. 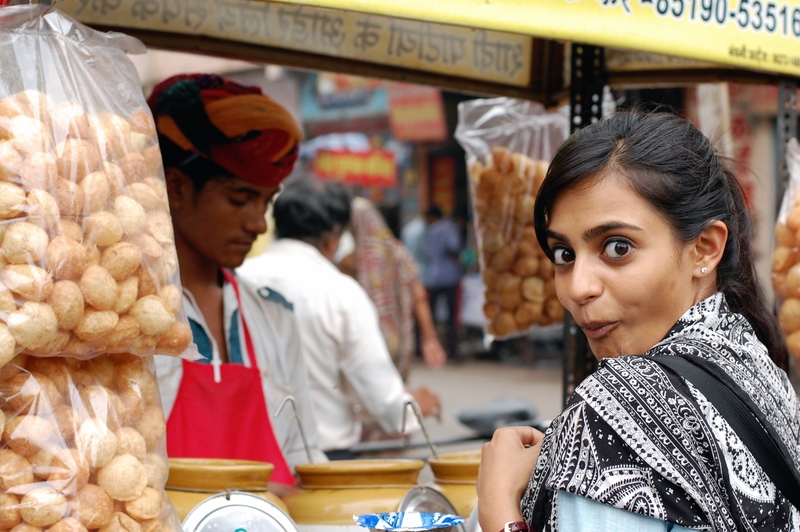 I’m sneaking in a pani puri from a streetside vendor. It was delicious! But please don’t tell anyone I drank that unfiltered water! 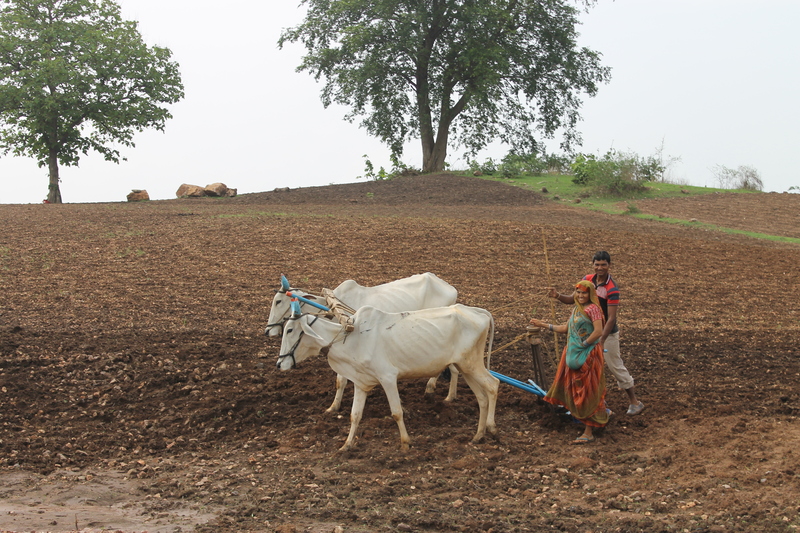 A couple ploughing the field before beginning to sow the seeds for this season.